Rob from Bill & Ben’s (based down in Chippenham) put together a nice little video explaining its benefits and how the Quick Qube grow tent works – great job! You can read the full review here or just scroll down! Without a doubt, some of the strongest & best engineered grow tents in the industry, the Quick Qube is basically an industrial Gazebo that is as simple to erect as it is to take down – essentially in minutes. Green Qube tents were developed as an answering call to the needs of the grow industry for a high quality yet low cost grow tent. Having over 15 years knowledge of global manufacture, they utilised this information to source only the highest grade materials. They work closely alongside developers, industry experts and growers alike, were able to develop end products that covered every need of the end user. The high-end UK engineered parts ensure long life & durability, with an estimated lifespan of double your average grow tent. It has a super strong, anti-corrosive aluminium frame for an extended lifespan and replaceable outer covers for extended frame use. Capable of taking up to 150kg hanging load weight, it’s no understatement that this thing is built like a tank. All Quick Qube grow tent frames come with a one year guarantee and new outer shells are sold separately for repeat frame use. In the unlikely event of a breakdown, Green Qube frames are interchangeable. If a part wears out over time it can simply be unscrewed and replaced. Every Green Qube / Quick Qube tent comes with a standard set of features which can be found across the whole range. This patented design allows inflow pipes to retain a horizontal position so water can enter the tent easily eliminating backwash and creates an easy flow of water. This enables gravity-based systems like Autopots and Hydropods to remain on one level and the plants get the nutrients they need as the system intends. There is also an air inlet sock that gives you 100% light proofing. An obvious but handy inclusion. These increase your plant’s energy stores by filtering out white light. Also helping to control the plant’s sleep/wake cycle. Large velcro fastenable flaps cover the windows, enabling the gardener to be able to view the plants from outside without disturbing the growing environment And potentially letting heat out or bugs and the cold in. Once resealed, the velcro flaps are 100% light tight. This is Green Qube’s exclusively engineered Mylar lining, considered by many as the gold standard of growing interiors, gives your grow space perfectly uniform light distribution and helps optimise your grow by creating a consistent environment for the plants. The debosed diamonds in Green Qube’s Reflect mylar creates even light distribution across the tent. They do this by reflecting in multiple directions avoiding heat build up and creating even light dispersal. Traditional hammered Mylar is flat, and like a mirror, when the light hits it, it reflects straight back, creating a greater chance of hotspots in the grow tent. Hotspots can have a huge impact on the plants, including overheating, damaged leaves and buds & general slowdown of growth. Now included as a free addition, when the larger Quick Qube’s are 1st set up the sides may have a tendency to bow inwards due to negative pressure from fans inside the tent. Expansion bars provide a simple solution whilst your plants are growing up to a size where the suction stops. 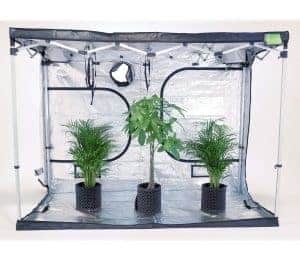 Every new Quick Qube tent includes a free Expansion Pack so you have the option to use them if your grow size warrants it. Green Qube confidently state their Mylar eradicates hotspots by 94% & offers superior reflectivity of 98%, enhancing your ecosystem for optimum plant growth. You can find out more about the Quick-Qube grow tents by visiting our Quick Qube page or browse our Quick Qube range.